The lower slopes are covered by a sea of Oaks and Aspens. Less than two weeks after the equinox and their leaves have cut back on chlorophyll production allowing the colors characteristic of the carotenoids to show through. These yellow, brown and orange pigments are present in the leaves throughout the growing season, but are usually masked by the dominance of chlorophyll. View facing west. Beautiful examples of large crystalline faces, characteristic of igneous intrusions which have cooled slowly. 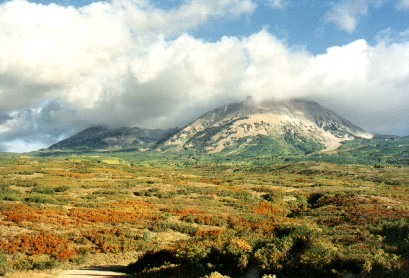 The La Sal Mountains originated during the Oligicene/Miocene (25 mya) as a cluster of laccoliths, hot magma which forced its way into fractures in overlying sedimentary rocks, creating an uplifted dome. The intrusions soon cooled and were gradually exposed as the overlying layers eroded away so that today the peaks are totally devoid of any remnant of the ancient beds. Not finding any path through the rocky basin above treeline, we slowly worked our way up the steep, snowy slopes (emerging at the first chute to the right of center, beyond the edge of the grass in the lower part of this picture). 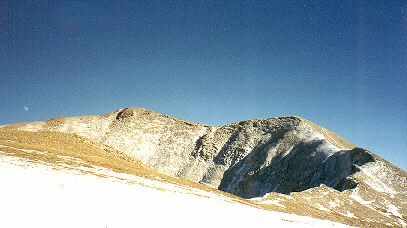 The summit is the mound to the left. 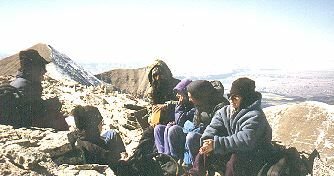 The wind was too strong and cold up there, so we came down and sat on the lower peak to the right. The moon rises on the far left; this view faces east. Break for lunch and look around. 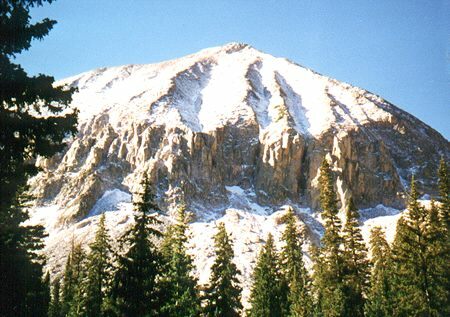 Tukuhnikivatz (12,483 ft.) is the peak to the left. This shot faces west. The lowlands to the right are the eroded mesas of Dead Horse Point and the Islands in the Sky district of Canyonlands National Park.